New Leeds owner Massimo Cellino was at Vicarage Road to see his side thrashed by play-off chasing Watford. Cellino confirmed earlier in the day that he had completed his controversial takeover of the Elland Road outfit. Almen Abdi gave Watford an early lead when he nodded home Ikechi Anya's cross, before Anya headed the second from Marco Davide Faraoni's centre. Troy Deeney's close-range strike left Watford seven points off sixth with a game in hand. Leeds have one win in 12. Indeed Leeds could count themselves fortunate their latest setback was not even heavier. Keeper Jack Butland had to deny Deeney, who also saw a late effort sail narrowly wide. Noel Hunt failed to convert Leeds' only decent chance, provided by Dominic Poleon, early in the second half. And the striker nearly landed himself in trouble with a late challenge on Faraoni that earned him a yellow card. Watford remain unbeaten at home since January 11 and are now seven points off the final play-off spot with a game in hand. Watford manager Beppe Sannino: "I don't like to speak about the play-offs. I like to speak about the next match. "It was a good win. Now we have six matches to play and hope to collect as many points as possible." 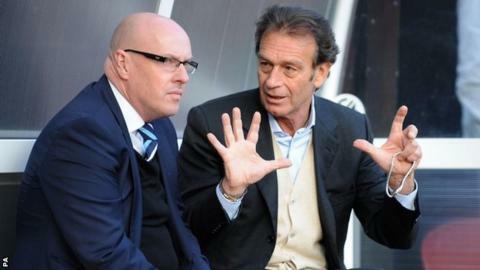 Leeds manager Brian McDermott: "Of course I'm under pressure - results suggest that. "I'm not in a strong position now because of the results we've had over a period of time. "I met [Cellino] before the game. We just talked about football. He's not looking to give me any assurances - I wouldn't expect any. "He's an ambitious man; that's certainly not the sort of performance he wants to see. "There's a big job here. It's a big club and there's a lot to be done, but he's got the clout to do it." Match ends, Watford 3, Leeds United 0. Second Half ends, Watford 3, Leeds United 0. Foul by Cameron Stewart (Leeds United). Substitution, Watford. Alexander Merkel replaces Sean Murray. Offside, Leeds United. Michael Brown tries a through ball, but Matt Smith is caught offside. Corner, Watford. Conceded by Cameron Stewart. Attempt blocked. Sean Murray (Watford) right footed shot from outside the box is blocked. Corner, Watford. Conceded by Jason Pearce. Attempt blocked. Lewis McGugan (Watford) left footed shot from a difficult angle on the right is blocked. Substitution, Watford. Daniel Pudil replaces Albert Riera. Substitution, Watford. Lewis McGugan replaces Almen Abdi. Substitution, Leeds United. Aidan White replaces Ross McCormack. Attempt missed. Stephen Warnock (Leeds United) left footed shot from the left side of the box is too high. Assisted by Scott Wootton with a cross. Corner, Leeds United. Conceded by Marco Cassetti. Delay in match Dominic Poleon (Leeds United) because of an injury. Corner, Watford. Conceded by Jack Butland. Attempt saved. Troy Deeney (Watford) left footed shot from the centre of the box is saved in the centre of the goal. Assisted by Ikechi Anya. Attempt saved. Dominic Poleon (Leeds United) right footed shot from the right side of the box is saved in the top right corner. Assisted by Ross McCormack. Marco Davide Faraoni (Watford) wins a free kick in the defensive half. Hand ball by Troy Deeney (Watford). Substitution, Leeds United. Matt Smith replaces Noel Hunt. Goal! Watford 3, Leeds United 0. Troy Deeney (Watford) right footed shot from the left side of the box to the top left corner. Assisted by Almen Abdi. Offside, Leeds United. Jason Pearce tries a through ball, but Noel Hunt is caught offside. Hand ball by Sean Murray (Watford). Hand ball by Almen Abdi (Watford). Attempt saved. Noel Hunt (Leeds United) header from the right side of the box is saved in the bottom right corner. Assisted by Tom Lees. Noel Hunt (Leeds United) is shown the yellow card. Cameron Stewart (Leeds United) wins a free kick in the defensive half. Attempt saved. Cameron Stewart (Leeds United) right footed shot from the left side of the box is saved in the centre of the goal. Assisted by Noel Hunt. Stephen Warnock (Leeds United) wins a free kick in the defensive half. Foul by Marco Davide Faraoni (Watford). Attempt missed. Daniel Tözsér (Watford) left footed shot from outside the box is close, but misses to the right. Attempt saved. Troy Deeney (Watford) right footed shot from a difficult angle on the right is saved in the centre of the goal. Assisted by Sean Murray. Scott Wootton (Leeds United) is shown the yellow card for a bad foul.